System which projects various information onto a transparent strip in the fi eld of vision of the driver so that they do not have to take their eyes off the road. 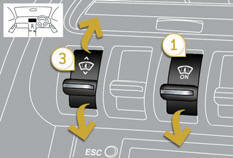 This system operates when the engine is running and the settings are stored when the ignition is switched off. 1. Head-up display on / off. The strip is activated by pressing one of the buttons. 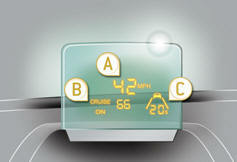 Once the system has been activated, the following information is grouped together in the head-up display: A. The speed of your vehicle. B. 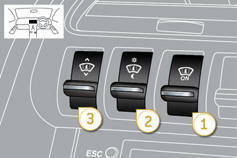 Cruise control/speed limiter information. Buttons Displays during operation C. "Distance alert" information (depending on version). With the engine running, press button 1 . 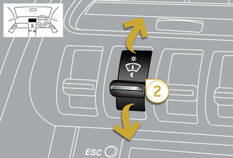 The activated/deactivated status when the engine was switched off is retained when the engine is switched on again. - down to move the display down. - down to decrease the brightness. 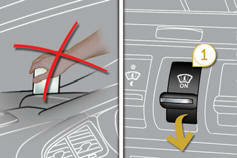 We recommend that adjustments are only made using these buttons when the vehicle is stationary. 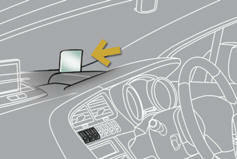 When stationary or while driving, no objects should be placed around the transparent strip (or on its cover) to avoid blocking the strip output and preventing its correct operation. In certain extreme weather conditions (rain and/or snow, bright sunshine, ...) the headup display may not be legible or may suffer temporary interference. Certain glasses (sunglasses, spectacles or polarised lenses) may hamper reading of the information. To clean the transparent strip, which is made of organic glass, use a clean, soft cloth (such as a spectacles cloth or microfi bre cloth). Do not use a dry or abrasive cloth or detergent or solvent products as these could scratch the strip or damage the anti-refl ection coating.